PSD with layered graphic assets. Let me know if you want more art in that style. "Let me know if you want more art in that style"
Yes yes and yes i would say! Thank you! Great stuff! Actually this is more than great. Hey Tatermand, I am going to use this :-) Originally I wanted a more pixel-arty style like http://opengameart.org/content/shmup-ships but I really dig your subsmission, its awesome! I love the clean, detailed style and the fact that the ships can be configured. Although impudent, I would like to request a few things (things that are missing from the other stuff I wanted to use thus far as well). For the record, I am building a space RTS game based on carrier warfare, think World War 2 Pacific Theater with large carrier groups operating fighter squadrons. No base building involved. missiles, beams and blasts, though these are definitly lowest on the list as there is lots of art appropriate to go with yours. Hey Vidmaster! Thanks, I'm glad that you like it! Actualy I have some plans to make capital and cargo ships, and other classes, and even races, but unfortunately I do not know when I can do it all. At what stage is your project? Thus I understand how much I have time for it. With explosions I have a problem - I'm not so good at animation. I can certainly do particles, but with frame by frame animation I'm afraid it will take too much time, and in such style procedural effects based on the drawn particles - probably will look better? However, to give you a more concrete answer, still a lot of time. I am currently quite busy with finishing my Masters and I need to update the scripting language and pathfinding AI first before I need the next content. And development is not content driven at all, as my in-house engine is general purpose. I am currently developing a Harvest Moon clone, the space RTS, a multiplayer NES-style Zelda-clone, a medieval strategy game and an arcade shooter in parallel to assure the engine's flexibility. While I do intent do get each of these games to an actually playable, polished state at some point the focus is still on engine development. I am a game designer and software engineer, I am not terribly good at Art (as my few submissions here on the side indicate). About long-term cooperation — sure, why not - I draw in my spare time, so I will be glad if someone will come in handy for a real project. By the way, I'm not an artist, too - project manager and game designer. Tatermand: Awesome style. You are absolutely talented. I hope the stuff you create for Vidmaster will be available for us poor ones too :P It's really great. I would absolutely love to see more in that style. There is a thing you could improve: The sparks of the stars should have all the same angle. This effect appears through the lense of the camera which shot a picture. It's fixed in the sense that all sparks on a picture have the same angle. Vidmaster: Your space game sounds similar to mine, i got rotable turrets too (they always point to your cursor) and complete free, real time controls. Is there something you have to show already? I'm always interested in sharing inspirations and ideas with other gamedevs :) My game is playable at http://websocket.bonsaiheld.org/ (multiplayer doesn't work at the moment). Nice game! Waiting for when it will be more complete, but already now I like it. I conceived this pack just for something like this! And yes, if I'm going to draw something in my free time - I'll upload it here. Ohhhh this is great. Cant wait to explore new planets and ships of you! 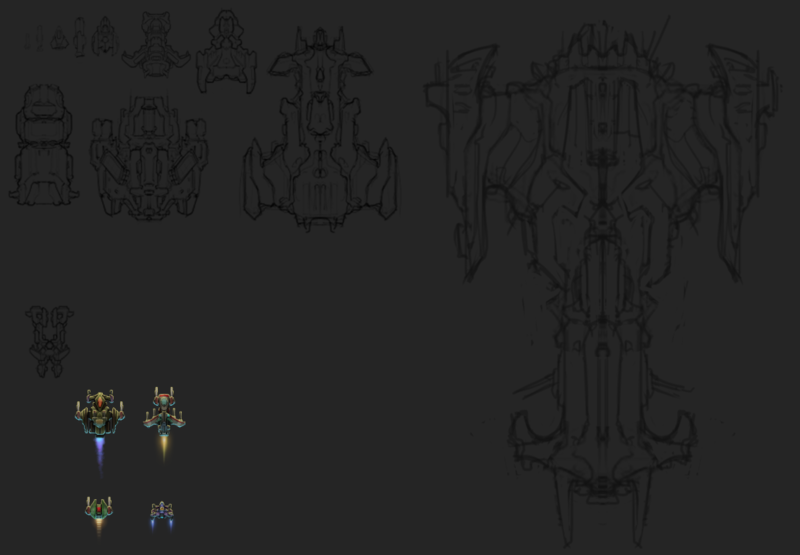 The black & white scribbles of the bigger ships already look promising! @Bonsaiheldin: Your game looks, feels and plays awesome! It´s already a lot of fun just to fly around, blast up some enemies, land and upgrade. Great work! More different planets, stars(maybe animated a bit: shining, glowing). Some star flashes/outbreakes would be nice. Woaaa! Feel hugged Tatermand! The art section in the credits of my little space game is yours! I would really like to use this, but since the update, the .psd file doesn't seem to work. Please either fix it or provide .xcf (gimp) files. Also, yes. More art in this style would definitely be great. tim_supermonk, I saved it in max compatibility with older versions. Sorry, I don't use gimp. Maybe something went wrong when you downloaded the file? Yes! It worked now. I had tried it multiple times before and it didn't work for some reason. By the way my username is Tim_Supermonkey, but OGA cut it off. This is awesome! I am really thinking about using these sprites to make an open world space game.Would it be possible to see some space stations or some bullets or projectiles? Maybe some alien creatures that will be in space? The more i play with your sprites the more i love them. epic job on this artwork i cant wait to see more. This is great. More like this would be wonderful. "Let me know if you want more art in that style." YES! This is exactly the style i have been looking for. I'm making a 2D space game, but i don't want the pixelart style. In my game i often use rotating turrets on top of the ships, so if you make some of those, I'll be very happy! Thank you guys! I am sorry that took so long to respond to you. IndieDevs, yes, I'm working on projectiles and other effects! Would it be ok if I were to use this and other art of yours in a game that I would release in a sponsorship agreement in which the sponsor (Newgrounds, Armourgames, etc.) would pay a certain amount to have the game branded with their logo? Of course I would credit you. If this is not possible would you be willing to add CC-BY licence? Thanks. PS: The game would be totally free to play. Wow. Those sketches look really good. By all means, please continue these. check it out the art credit is your!! Hey guys! Thank you all, for games that you made with this art, and your comments. I made a tutorial about the style in which I work, so please, enjoy and leave your feedbacks! Could you please make and svg or png version of this? Hello!Keep up the good work sir your art is amazing!!! Is there any chance you can reupload it as CC-BY license or CC0 like your space effects file? Thank you for sharing these amazing sprites! Do you have any additional sprites for sale anywhere? Thanks again for sharing these! Free download. Full credits on main screen, thanks for sharing! I really like your art, fantastic! I am looking at using some of this set in my new game. I'm lookiing specifically at the layer named "Cold Nebula". It's really awesome but if you examine it as a seperate layer you will see in the bottom right portion of the image that there is a noticable large oval shape that looks pretty ugly when the image is scaled up. Is there any chance you might update this pack and correct that issue? Can i use this in a commcerical game? your comment "send me a free copy of the game" is a bit confusing with the CC-BY-SA licensing? Thank you Tatermand for sharing this beautiful pieces. 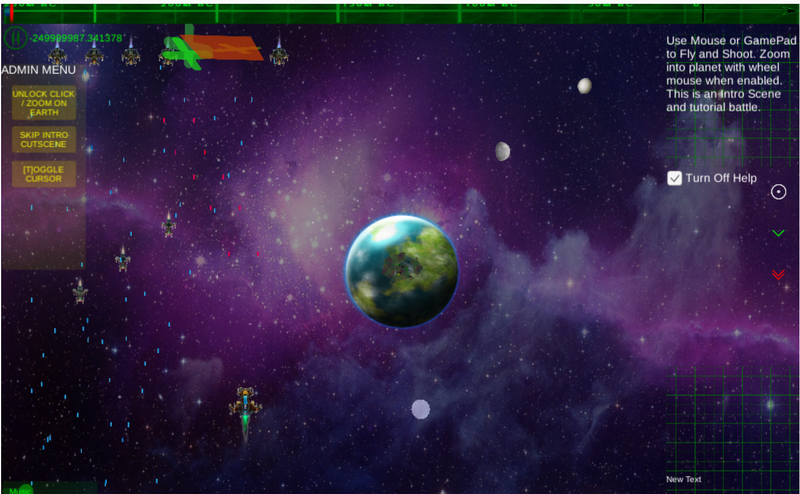 I'm using your planets in my shoot'em up, Infinity - To The Top. I am going to use this in my online browser game. It's going to actually take some time, but as long as it's going to be a browser game, a copy wouldn't be right thing, you know. But I am going to create some packs later on, so the best pack for you for free should go as well? And what about credits? What should I put inside about you? 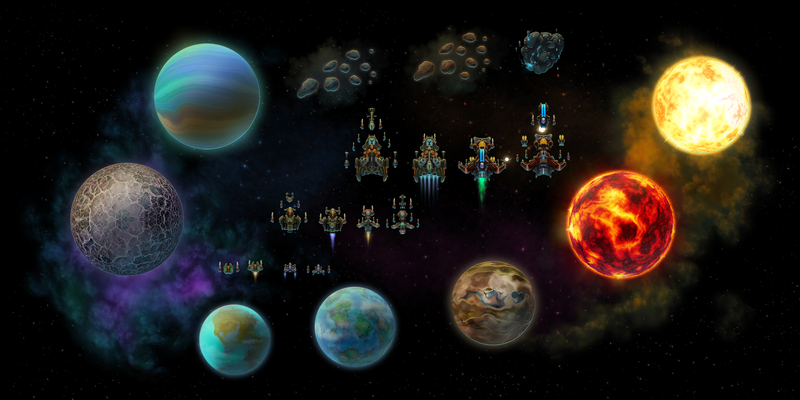 I used some of this art in my Steam game Asteroid Deflector XL - thanks a lot. A key is in your mail Tatermand! Hey, thanks for your great work. I used this asset in my academic project for Construct 3 in UCSC CMPM 80K. And I will credit you for that even though I will not publish that game. Please let me know if you have any inconvenience.